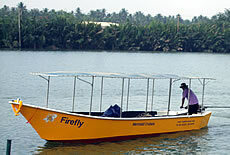 an hour from Hua Hin, float into pristine mangroves and along the Pranburi River on the world’s first electrically powered long-tail passenger boat, which will transport you in serene silence to secret spots where you can admire local flora and fauna, such as monitor lizards, exquisite Kingfishers, egrets and bee eaters. Mermaid cruises are the only company in Thailand to design, build and operate environmentally friendly, electric-powered boats for cruises: no emissions, pollution or noise. They employ local staff, source from local farms, support local orphanages and work with local authorities to organise educational trips for school children.